The 41-24 box score from the Oregon vs Colorado contest would indicate, at least on the surface, that the Ducks are back to running opponents out of the building. However, questions regarding the quarterback position reached an all time high as former walk-on signal-caller Taylor Allie and wide receiver Bralon Addison took snaps as Oregon’s No. 1 QB this past weekend. Enter unknown local product Justin Herbert (NR/Eugene, Ore.). A 6’5, 220 lb. dual threat, Herbert was on his way to an eventual Oregon Class 6A Player of the Year award before he broke his femur early in his junior season. Now healthy in 2015, a rejuvenated Herbert has perennial power Sheldon High on another championship run despite an early season loss to Jesuit in which the senior signal caller tossed for a mere 471 yards and 5 touchdowns. 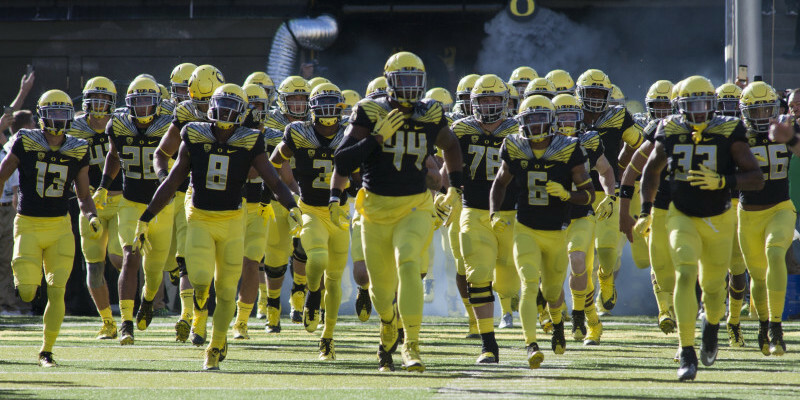 The whole of the state took notice, including Oregon offensive coordinator Scott Frost. “(Coach Frost) told me they might still be looking for another quarterback,” said Herbert. And just what would an offer mean for the local prep standout? “(Coach Frost) asked if they offered what sort of impact that would have. I told him that would be a big offer for me. So he told me to talk to my parents about it and he will get back to me in a few days. Stay tuned, Duck faithful, as an offer from Oregon is highly likely to lead to a commitment from Herbert.